The whole series ran from 1989-1995. Pierre-Yves Pelletier designed these stamps with the help of illustrations by Jean-Pierre Armanville. 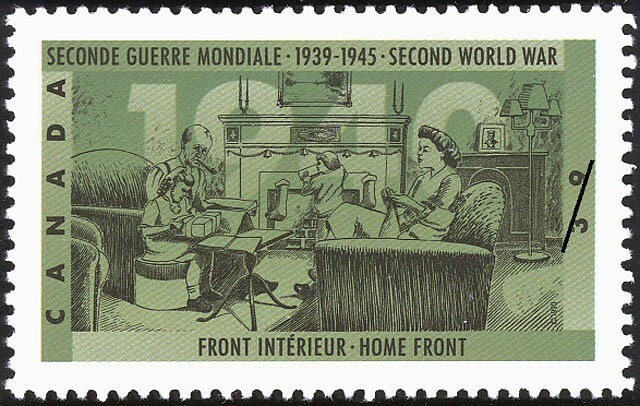 Clockwise from top left, the first stamp reflects the hardships endured by people who stayed on the Home Front followed by the Communal War Efforts where the "many communal activities, organizations and programs that were created boosted the morale and provided assistance to troops, prisoners of war and their families". "Through research, inventions and innovations, scientists and medical doctors made significant technological developments, which helped to win the war" for Science and War. And finally, Canada's important contribution in Food Production helped feed the Allied nations. The details are a bit hard to see unless you can enlarge the stamp, which I have done here for you with this one from the Canada Post Archives. Mother may be knitting socks for the troops, while one child is hanging stockings which may or may not have an orange in the toe. Another child is perhaps wrapping a present in old newspaper after Grandfather has finished reading the latest updates. Quite a somber set of stamps, and interesting topics related to WW2. I was trying to think of a description for these stamps - sombre is the perfect word. I like that it focuses on non-military people. as all of war must be! this is a group that is often forgotten. 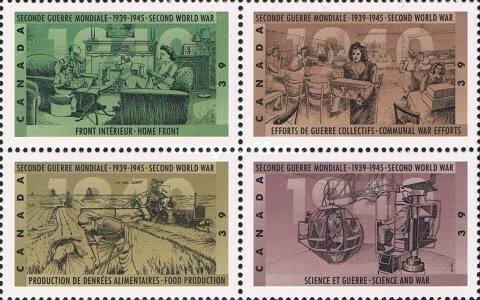 An interesting set, they have the feel of stamps from an earlier time, I think it's the use of one colour. Very nice series of stamps and I guess I could have been that child had we lived in Canada... my dad was in the US Navy at that time. But the picture looks more old fashioned even than my childhood .... more like WW 1 era than II. I like this stamp... more for the knitting theme than for the war theme!